I have used Padlet in the past when I have attended training courses, but at a department meeting this week I was reminded how simple and effective Padlet can be for student collaboration. 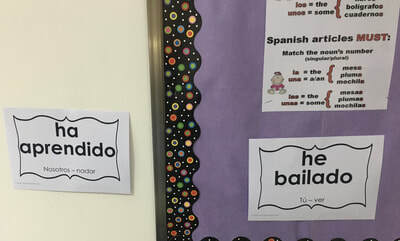 This afternoon I decided to use it with my Spanish Phase 2 class. 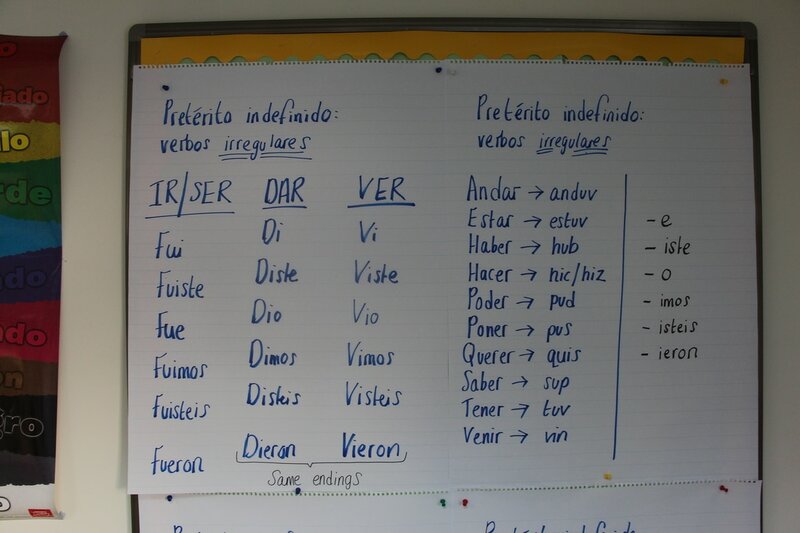 The students have been learning about pronominal verbs and for their homework had to write sentences using a selection of these verbs in different tenses. 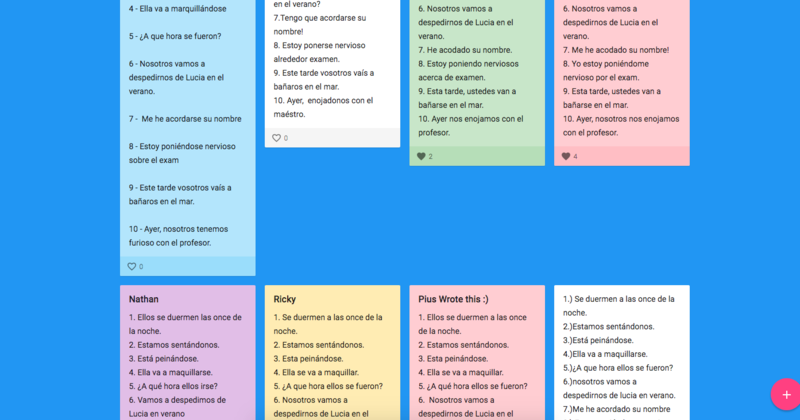 This time, instead of them writing their answers on a mini-whiteboard, they typed their sentences one by one into Padlet. 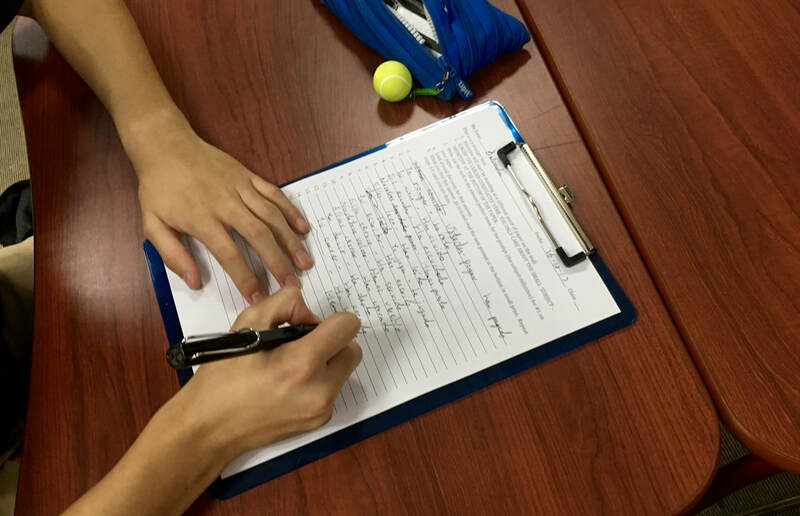 As they typed it was a fantastic opportunity for them to see what the others were writing, and as a class, we could identify mistakes as well as like the responses that were correct. Admittedly, with 10 sentences to write for homework, writing all of these in Padlet was a bit of a lengthy task. However, it was a very simple and effective activity that I intend to use again in the future for shorter tasks. A colleague reminded me that Padlet is the perfect tool when students are learning how to effectively describe a picture for a speaking exam (MYP, DP or GCSE). As the students share their descriptions of the picture, they can look at the other student contributions for more ideas and inspiration. So, how do we use Padlet? Simply sign up here and follow the very simple, user-friendly instructions. 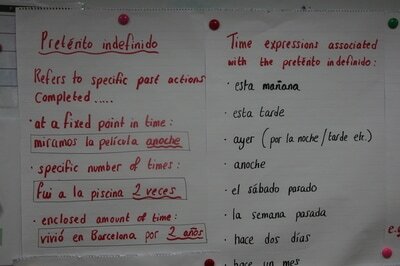 Today I introduced the present perfect tense to my Spanish class. 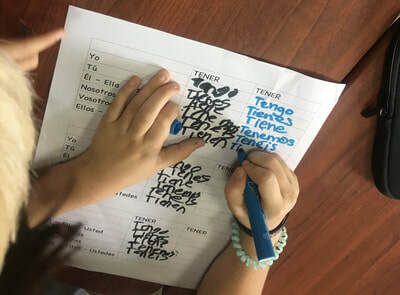 I started by giving them general guidelines about when to use the present perfect tense and then gave them instructions to start their scavenger hunt so that they could inquire and discover the patterns of present perfect tense independently. I bought this scavenger hunt from TPT and put up the papers around my classroom. 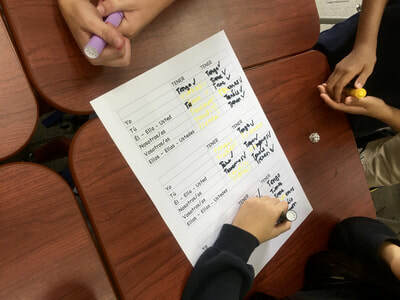 The students, armed with their clipboards and their student handout, set out to find the conjugations of a range of verbs in the present perfect. 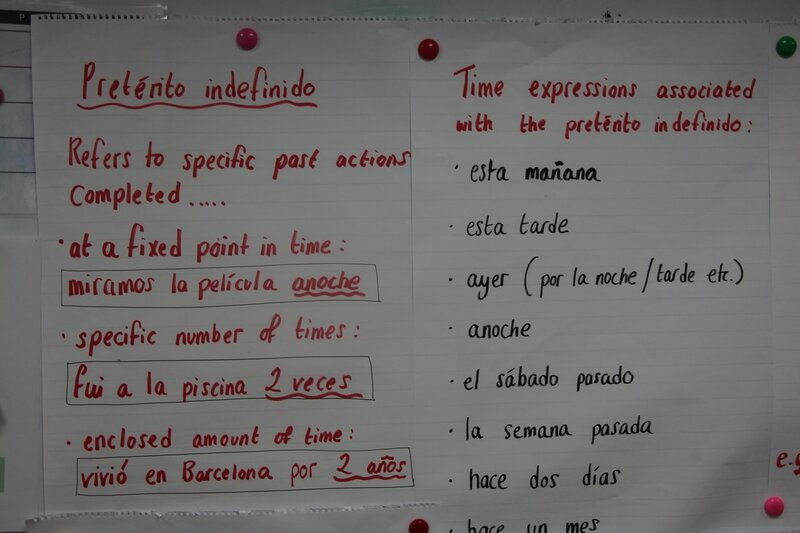 Once they had moved around the room from clue to clue and written the information down, they worked in pairs and groups to figure out the present tense conjugation of the verb HABER and identify the patterns of the regular past participles. This activity worked wonderfully and I was delighted that the students were able to work by themselves to figure out the rules of this verb tense. I think that I may be doing scavenger hunts on a regular basis! Group your students in pairs. 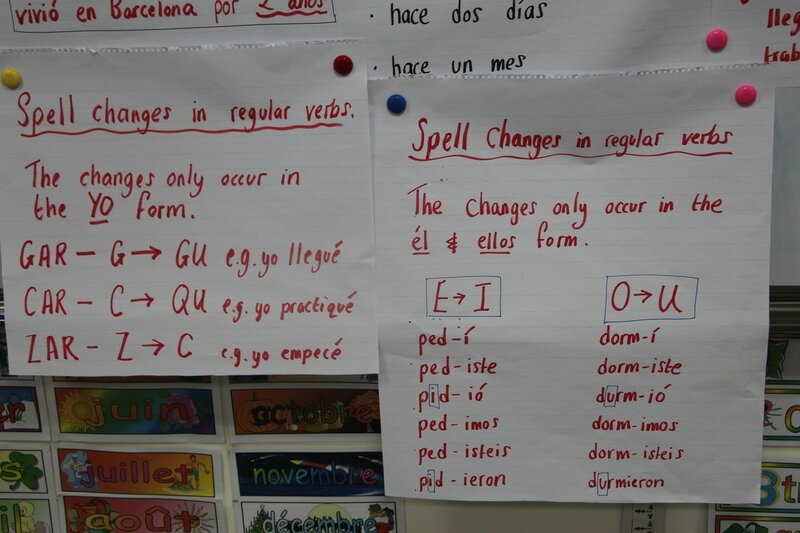 Print out a paper on which the students can conjugate a verb multiple times and give it to each pair of students. Give each student a different colour pen, and give each pair of students a dice. 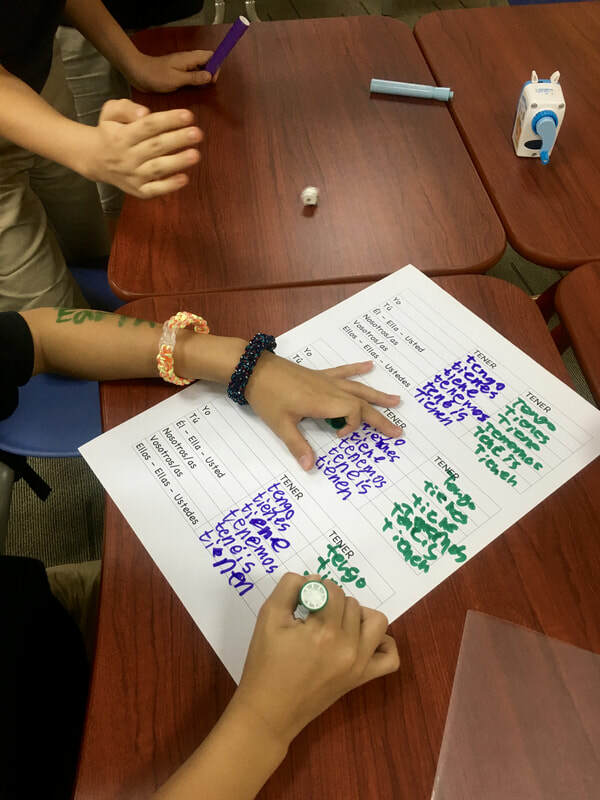 Students roll a dice to decide who in their pair begins the game. 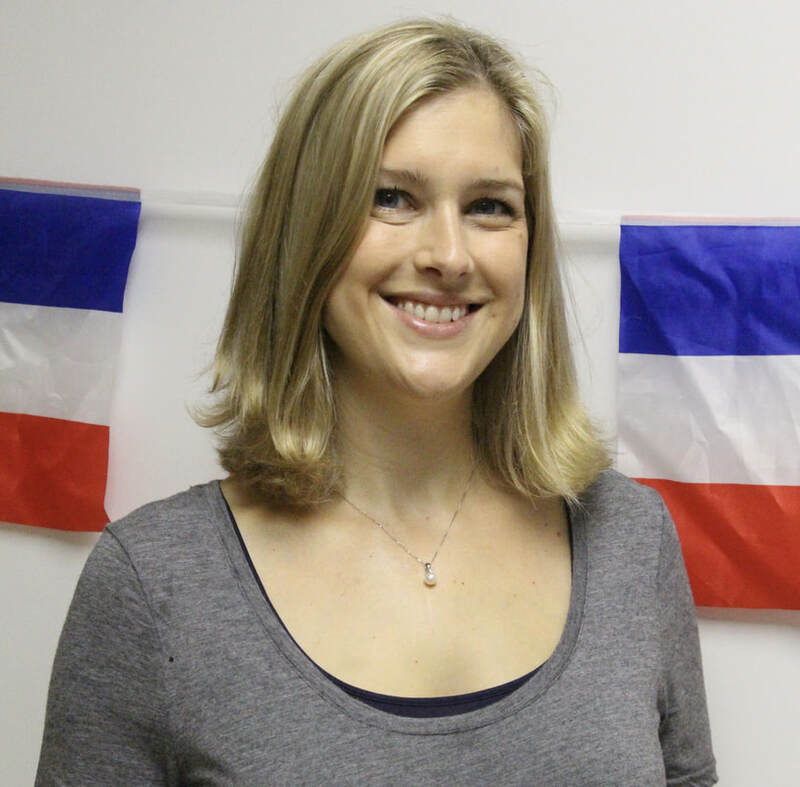 The person who starts the game, begins to write out the conjugation of the verb on the paper. They can start anywhere on the paper, it doesn't matter. While one student is writing, the other is continually rolling the dice until they get a six. 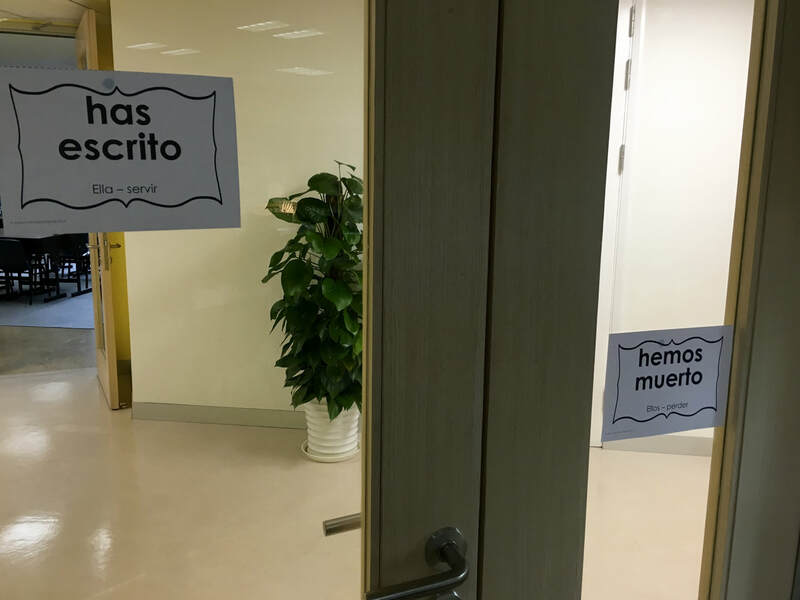 When they get a six their call ¡SEIS!, and take the paper so that they can now write out conjugations of the verb in the spaces. 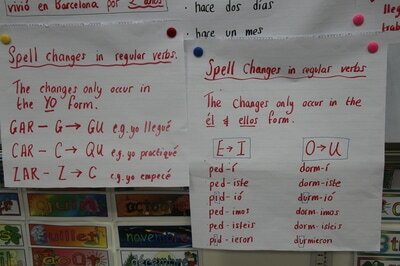 The students keep writing and switching and the game ends when all the spaces have been filled with the conjugations. 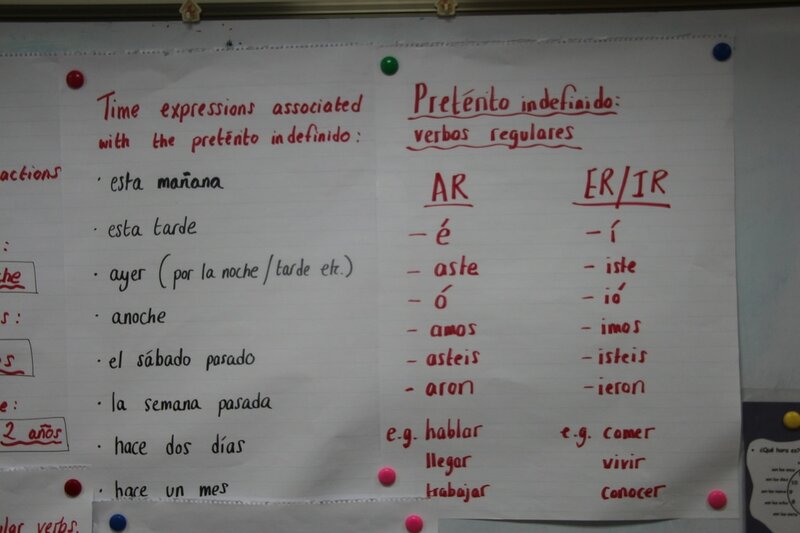 Finally the students check that all of the conjugations are correct, and cross out any conjugations that contain errors. They count up how many conjugations each student has written correctly (easy because they are writing in different colours), and the students with the most is the winner! After having learnt the conjugations of regular verbs in the pretérito indefinido, my students needed to master the endless conjugations of irregular verbs. 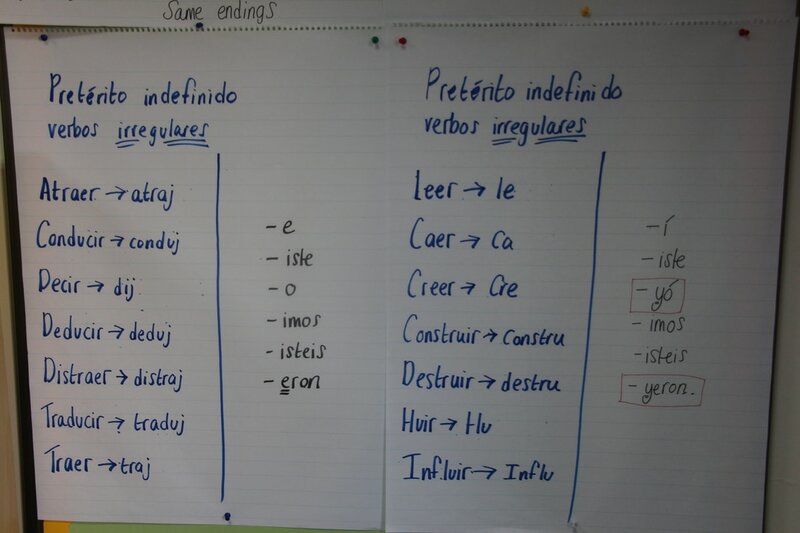 It is always difficult to know the most effective way of teaching the conjugations of irregular verbs, but I decided to summarise the conjugations in a simple overview worksheet, with the conjugations grouped by colour. The worksheet is available to download here. 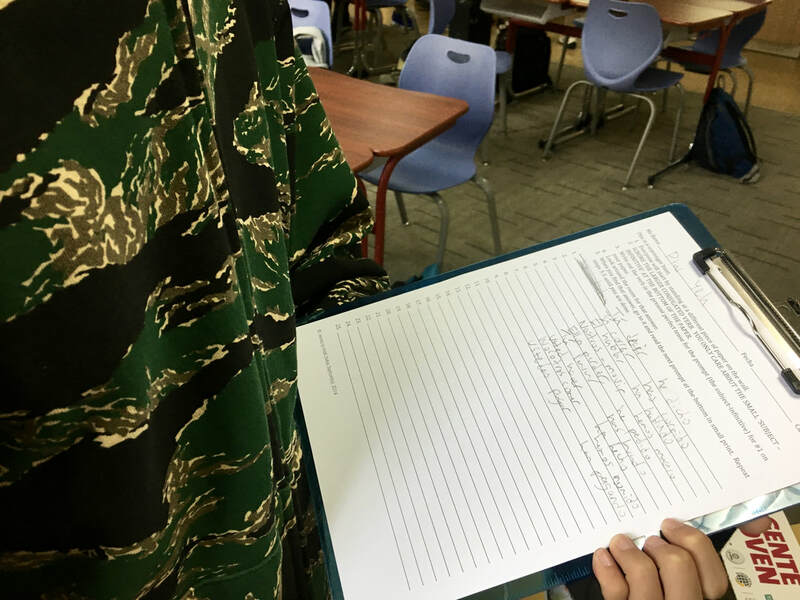 Once the students had completed the worksheet and it had been checked for errors, I laminated the sheets for them so that we could continue to refer to them in following lessons without them being lost or crumpled – well here’s hoping! 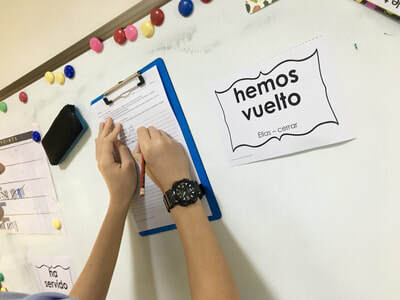 Now it was time to practice, which we by completing a worksheet (which is available for download here), and by playing a game with two sets of verb cards (available for download here). 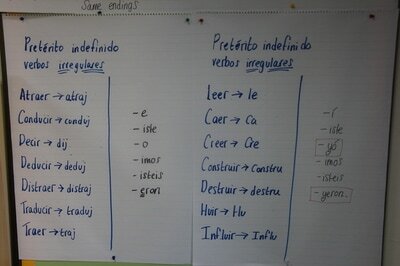 We did not practice all the verbs together at one time but divided them into their groups and played in stages. 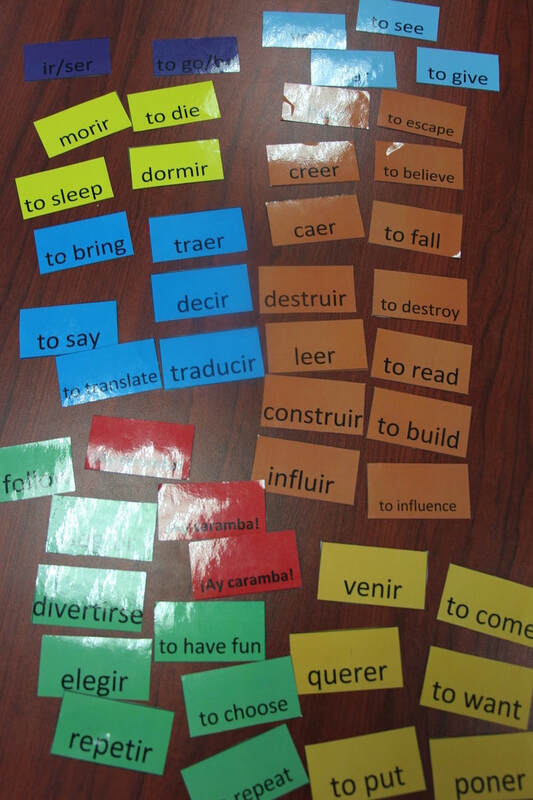 Put the cards face up and match the Spanish verbs with the English verbs. 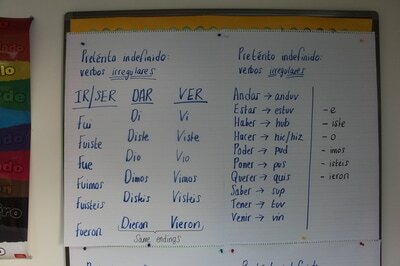 Write the Spanish verbs on the worksheet. Put any cards that you are confident you already to know to one side. Using the remaining cards, turn them over face down and play pairs. Use the worksheet to check each other’s answers. Now look at all of the Spanish verb cards. 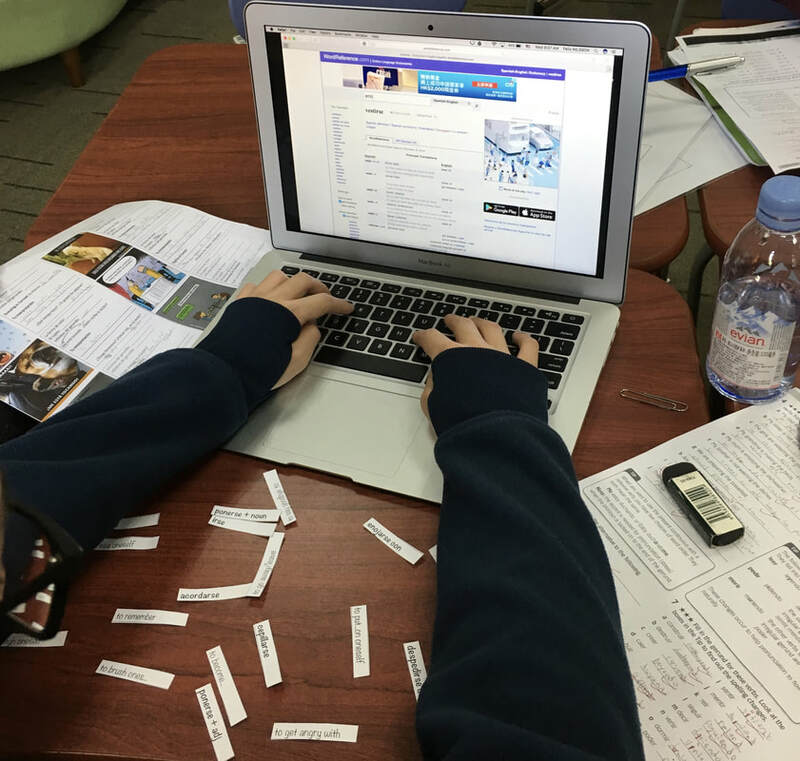 Categorise the verbs into groups according to their colour, discuss and review the conjugations of these verbs using your laminated sheets. All the cards should be facing downwards on the table. 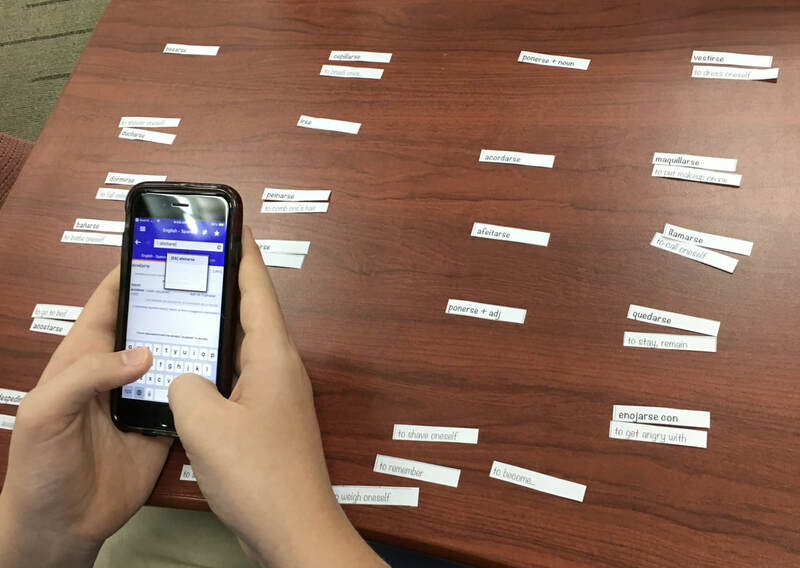 A student chooses a card and if they know the meaning of the card they can play their turn. If they do not know the meaning of card, they replace it on the table and miss their go. 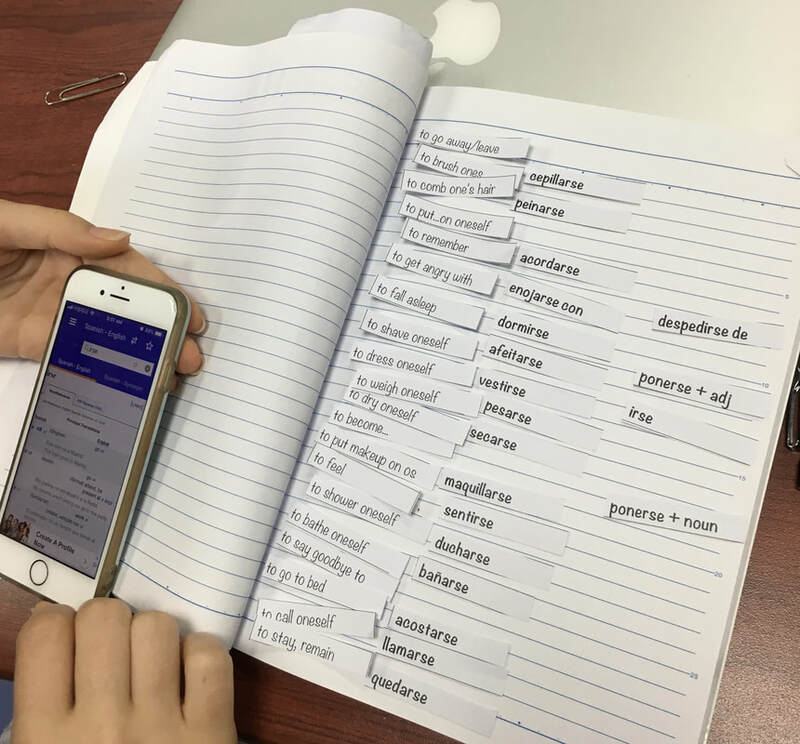 If the conjugation is correct (the other player can check the conjugation on the laminated cards), they keep the card and score 1 point. The player with the most cards and points at the end of the game wins. If you want to mix the game up a little by adding an element of chance then you can also include some ¡Ay caramba! cards. 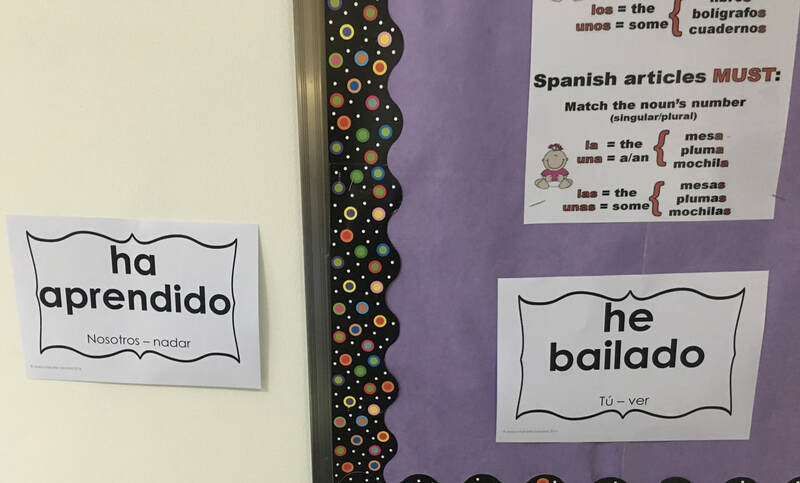 If a student picks an ¡Ay caramba! 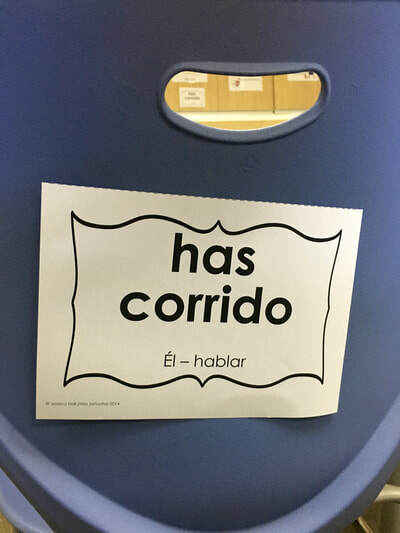 card before they have won any verb cards, then the ¡Ay caramba! card simply gets put back into the game. 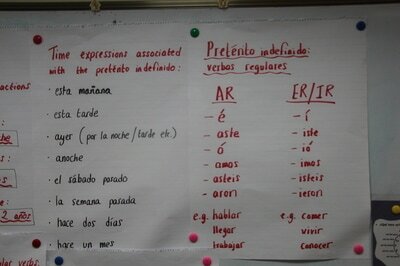 However, if a student has already won some verb cards and they then select the ¡Ay caramba! card, they have to give up all of their verb cards and place them back in the game. Be sure to keep the ¡Ay caramba! card out of the game at this point because if they are not removed then the game will go on forever!